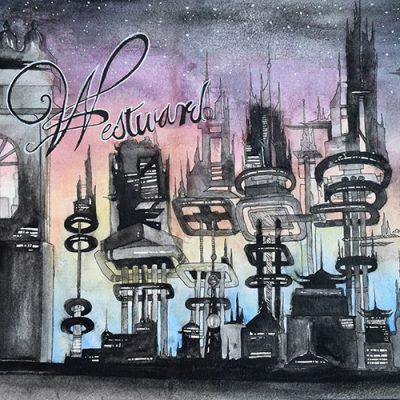 I hesitate to call the second full release from Westward an album—it’s more of a journey, a musical odyssey through riff cathedrals, melody valleys and everything else that makes up an Empire of Deception. As the group winds their way through epic corridors of guitar solos and over lyrical mountains, their style begins to reveal a sense of gravity. Westward’s songs are vibrant and full of personality, with guitar, bass, drums and vocals coming together in an eruption of music. The album moves between hard rock and listless ballads with tact and a great sense of progression, slowly building a groove before releasing into a lighthearted denouement. If you’re looking for a polished power trio putting together some topnotch rock, I suggest you look no further than Westward. Thrumming bass progressions, guitar arpeggios and Andrew Marshall’s melodic voice are the soul of Westward, with Matt Morrison’s steady drumbeats gluing it all together. For a mere three-member band, Westward deliver an extraordinary amount of sound. The mix always sounds thick, and when things get real heavy, like at the end of “Enchantment,” I could’ve been convinced that there was another person jamming along. I was extremely surprised at how soft the band got at the end of the album in “Defiance” after a slew of head-banging narratives like “Time” and “Risk Factor,” but Marshall’s easygoing voice soars over the musical landscape and ties the whole album off with a welcome release of energy that more than once had me spinning the whole record again.